The US Drug Enforcement Administration may have been responsible for the tip off that led to Cassie Sainsbury’s arrest for alleged drug trafficking in Colombia. A photo of Cassandra Sainsbury released by Colombian police after her arrest at the international airport in Bogota. As Sainsbury’s family maintain she was duped into carrying 5.8kg of cocaine in her luggage by a male acquaintance who sold her 15 cheap sets of headphones, reports from the Colombian capital claim she was identified as a possible drug smuggler to local authorities before she departed for the airport. 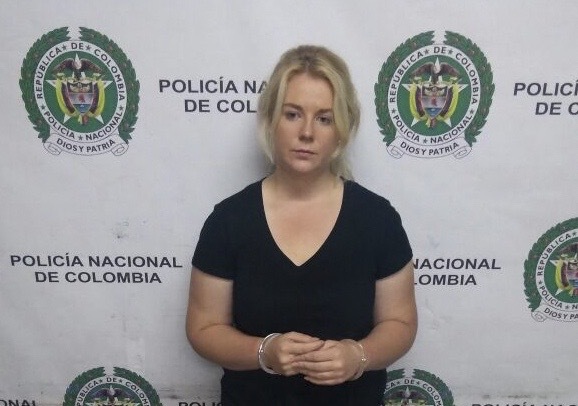 Sainsbury arrived in Colombia on April 3 and Channel Seven reports from Bogota say the US DEA forwarded her photograph and passport details to Colombian police as early as April 5, warning she may attempt to smuggle cocaine. Sainsbury was apprehended at Bogota’s international airport on April 12 and grim police photos released Tuesday show the Australian woman handcuffed beside 18 wrapped bundles that allegedly contained drugs. “We found her because of an alert from the DEA,” Bogota airport’s narcotics chief, Commander Rodrigo Soler, told News Corp.
Soler said she had cleared security and checked her bag when the alert came up. Soler told The Australian Sainsbury’s ticket, which was bought by an unknown party, was one of several red flags that caused North American agencies to alert Colombian police. If found guilty of attempting to smuggle the drugs, she faces a maximum sentence of more than 20 years in jail. Confusion also surrounds Sainsbury’s reason for visiting Colombia, with initial reports that she was on a working holiday to promote personal training contradicted by her fiance Scott Broadbridge. Broadbridge wrote on the FundRazr page set up to raise money for Sainsbury’s defence that his fiance had not been a personal trainer for six months prior to the trip. “Although Cassie is a PT, she is not currently personal training and hasn’t been for six months. I don’t know why that was mentioned at all,” he wrote. Details of her travel itinerary are also confusing, with Sainsbuiry’s sister Khala originally telling reporters she was due to return to Australia on April 15. However, reports in Colombian media suggested she may have intended to continue her journey to make presentations in London, France and Hong Kong. Khala Sainsbury previously told The Australian newspaper that her sister went with a male friend she met before traveling to South America to buy headphones in Bogota as gifts for her bridal party ahead of her upcoming wedding. The merchandise was purchased from a contact in a pre-wrapped package, her sister said. It’s understood lawyers in Australia have advised Sainsbury’s family not to make any further public comments, fearing they might unwittingly influence her trial with conflicting information. Experts also warned that damaging statements towards Colombia and its legal system could hurt Sainsbury. Khala posted a string of critical statements on the FundRazr page, calling the South American nation “such a corrupt country”. “The authorities rushed through her hearing, and [she] was denied bail. It sounds like they want to make an example of her. Now because of being denied bail, she is now being held at Colombia’s biggest women’s prison, which is over-populated by about 50,000 people,” she wrote. However, according to those with an understanding of the Colombian judicial system, the message won’t be taken lightly. “Some of these comments from Australia have reached Colombia, and when Colombians hear their country is all corrupt and that there’s no justice here, it’s not making the best impression for Cassie,” Colombian-based journalist Toby Muse told The Project. “Cassie is going to have to go to trial here in Colombia, that’s in front of a Colombian judge, a Colombian prosecutor and a Colombian defence lawyer. The family were also reportedly advised to end the FundRazr, which closed at $4232 raised. Sainsbury and Broadbridge’s Facebook pages have also been removed. This article was first published by The New Daily.